Getting your basic recipes of Thai cooking correct is critical. Think Thai Cooking and you immediately think of Coconut Milk! Ah, this marvelous ingredient... it is nothing short of magical. Its soothing flavour, pleasing aroma and rich mouth-feel rise above even the spiciest of ingredients, to give the dish a characteristic Thai touch. In fact, if it were not for the use of coconut milk, the abundant use of garlic and spices might make Thai dishes a bit overwhelming – but this great ingredient balances all other flavours and makes a dish taste brilliant! Green Curry Paste : An authentic thai paste made by using fresh green herbs and spices. It is extremely flavourful and aromatic and can be added to different vegetables to form thai curries. A basic thai paste made using green herbs and spices which is used as a base in various thai curries and soups. 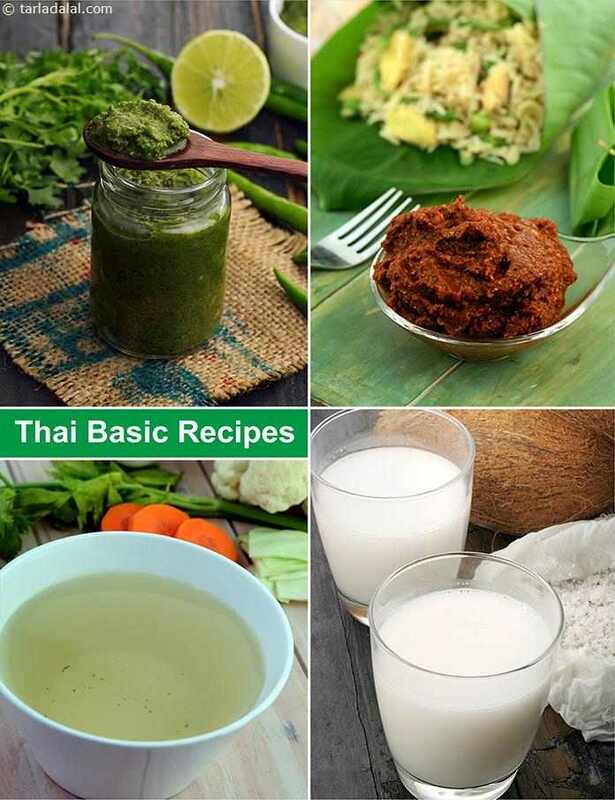 Get the step by step instruction to prepare the authentic Red Thai curry paste in traditional way. The red Thai curry paste can be added to vegetables and rice and enjoyed as main course. A simple and tempting Thai dressing recipe at tarladalal.com. A vegetarian favorite, Thai dressing is easy to prepare and can be used for salads and stir fries. An easy recipe to prepare the versatile Vegetable stock which can be used to prepare vegetable dishes, soups or even chicken recipe. The vegetable stock is prepared from a range of vegetables and is a healthy way of restoring the nutrients lost in the boiling process. Thai curry Paste is a basic paste used in many of the thai recipes. This can be prepared well in advance.